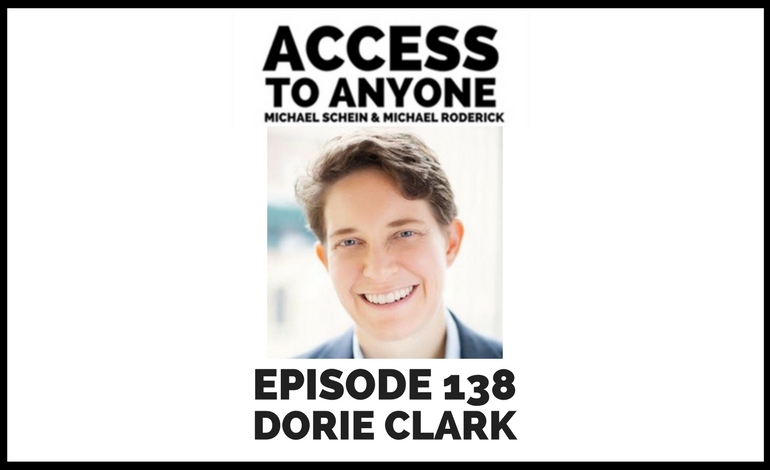 In today’s episode, we’re taking a look back at one of our favorite interviews – bestselling author Dorie Clark. Dorie Clark is the maestro of making connections. As an illustrious professional speaker, marketing strategy consultant, and contributing writer and author, she is continuously interacting with and forming friendships with important and influential people. Today she discusses how she harnesses the hidden powers of introversion and content creation to make connections, and why throwing a killer dinner party is one of the best ways of building real relationships. Using the power of introversion to become an impressive networker. Why surrounding yourself with interesting people will lead to the best opportunities. How to use content to make valuable connections. How to use the ladder strategy to advance your platform. Dorie Clark is a marketing strategy consultant, professional speaker, and frequent contributor to the Harvard Business Review, TIME, Entrepreneur, and the World Economic Forum blog. Recognized as a “branding expert” by the Associated Press, Fortune, and Inc. magazine, she is the author of Reinventing You: Define Your Brand, Imagine Your Future and her most recent book, Stand Out: How to Find Your Breakthrough Idea and Build a Following Around It, was released in April 2015.